Entrez dans ce lotissement VIP Timbers situé sur le parcours de golf Sierra Star, à seulement 5 pâtés de maisons du télésiège 15 à Eagle Run et à quelques pâtés de maisons du village. Idéalement situé à quelques pas d'un arrêt de navette gratuit (juste en bas de l'allée) qui relie Eagle Lodge, The Village et Main Lodge. Cette maison de ville sur trois niveaux peut accueillir jusqu'à 12 personnes et dispose d'une très grande cuisine gastronomique entièrement équipée avec îlot, comptoir en granit, parquet et appareils électroménagers Viking en acier inoxydable. Cette maison de ville est équipée de mobilier flambant neuf, de salles de bains rénovées, de tapis et de peinture! Dînez autour de la grande table ronde pouvant accueillir jusqu'à 6 personnes, et 4 autres personnes peuvent dîner au bar / tabourets de la cuisine au centre de l'île. Timbers # 1033 dispose également de deux ponts; le pont inférieur est équipé d'un spa privé et le pont supérieur est idéalement situé à l'écart de la cuisine, offrant un tout nouveau barbecue / grill. Profitez d'une journée de golf! Timbers # 1033 est situé sur le 17e fairway du Seirra Star Golf Course! Chambre à coucher principale (troisième niveau): 1 California King avec salle de bain privée avec douche / baignoire, dressing et télévision à écran plat 40 "
Deuxième chambre (niveau inférieur): 1 lit queen avec salle de bain commune, téléviseur à écran plat 32 "
Den (niveau inférieur): 1 canapé-lit queen-size, téléviseur à écran plat 46 "et X-BOX. Salon: 46 "TV / home cinéma. Timbers # 1033 est vraiment votre chez-vous! Vous ne voudrez plus jamais partir! Your home was perfect for our Friendsgiving getaway. Plenty of space for our two families (could have fit a third). Comfortable living room sectional, large dining table with extra seats at the kitchen island. More than enough cookware and dishes. Beds and all linens were comfortable. Easy to control the temperature throughout the home. 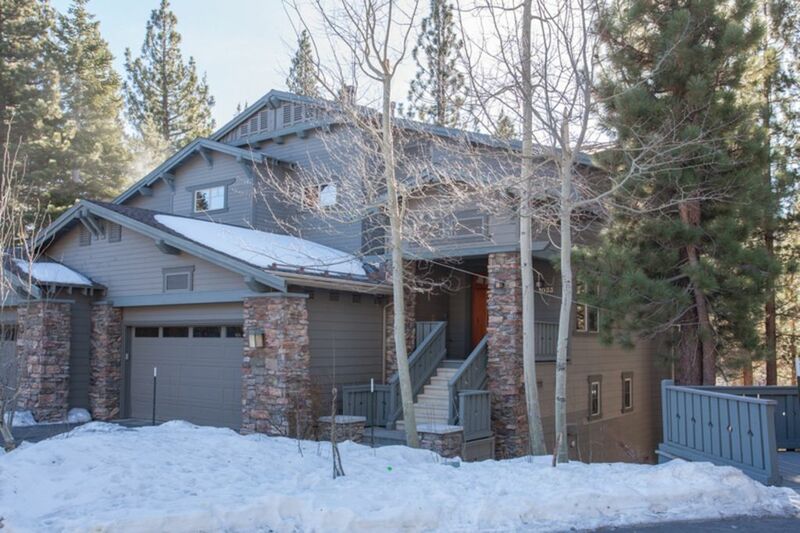 Quiet neighborhood and close to all the conveniences - and skiing - we came for! The only thing we would have appreciated would have been some humidifiers to help with the dry winter air, but we made due. Very nice accommodations. Spacious and beautiful. The first day we got here, we bought groceries and loaded up the fridge. Next morning, we opened the fridge and freezer and found them to be at room temperature, and the food spoiled. Called the property management company and they said yes, we get calls about this all the time, and tried to tell us it was our fault for putting too many items in the freezer! They did send someone out to take a look though that same day, and to their credit, they then later admitted that yes, it was broken, and they brought in a small replacement refrigerator. When we got back from our first day of skiing, we settled in to relax at the house, and the power went out. When we called the property management again, they said yes, it was a known issue, and we just had to climb down the steep bank of snow around the side of the house, and flip the main breaker to the house outside. They sent someone over in minutes to do it for us, which was awesome, but if it was a known issue, why on earth did they not get it fixed earlier, or at least warn us about it? The power proceeded to go off 6 times that evening, with Alex coming over 3 times, and then we climbed down to flip the breaker the next 3 because we felt bad for disturbing him. Eventually, on our fourth day here, they did get someone out to fix the power and the fridge, and they were very accommodating for our troubles. But if they had received previous complaints about these issues, as they admitted, I don't get why they couldn't have just been more proactive and taken care of it before we got here. Finally, the deck around the hot tub was littered with beer cans, bottle caps, and cigarette butts. I think their cleaning crew is a bit lazy. During this visit, the refrigerator failed and the main building breaker (located on an exterior wall) began tripping. In each case we sent our staff to address the problems with response times of under 20 minutes. REFRIGERATOR: We inspect every unit before and after every stay. Our inspectors carry instant read thermometers and take readings in the fridge and freezer each visit. This unit tested @ 37 prior to check in. When the guest called to report the refrigerator wasn't holding temp, I informed him that we frequently see false alarms (guests bring a car full of food on a long drive, then fill an otherwise empty fridge, causing the internal temp to soar). It can take extra time to get back to normal. I sent my staff immediately to take a temp reading (this was 10am) and then again to take another at noon to determine if the appliance was cooling. We brought a mid-size portable fridge, just in case. At noon the fridge (a sub zero wall unit) had not cooled so we installed the portable and moved the guests food for them. The guest reported some food was spoiled so we immediately reimbursed them and scheduled a local appliance repair tech to repair it ASAP (before they checked out it was fixed). MAIN BREAKER: The main breaker had tripped twice before. Once several weeks earlier, and then once again the week prior (when the property owner was there). We had ordered a part for its replacement prior to this guest's visit, and had the work scheduled to be done after their departure (the part hadn't arrived yet when they checked in). It never tripped twice in a row and we saw no reason to cancel this guest's visit over it. The unit is rented regularly and it was never a problem. When it became clear during this guests stay that the breaker wouldn't stay ON (a new development) we offered to relocate the guests to another property. They did not want to relocate, and we could not keep sending staff to flip the switch back on every time it shut off. The guest offered to take responsibility for resetting the switch for themselves, and we expedited the repair, completing it during their stay. Even the reviewer describes us with words like "to their credit", "awesome", "came in minutes." Incredible home, even better than imagined. The cabin was so beautiful and spacious. It was remarkably better than even the pictures suggested. We loved it so much that we spent most of our time at night staying in and hanging out rather than going out in town. Also the location next to Eagle Lodge is so convenient. 5 min shuttle ride and your on the mountain ready to ride. Great place. Can't wait to come back. Very nice townhome. Clean and updated. Short walk to bus stop and 2 minute ride to the ski slopes. Kitchen well equipped, and kids enjoyed gaming in the den. Would definitely stay here again.